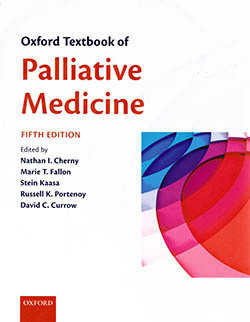 Now in its fifth edition, this comprehensive textbook comprising research by 234 international contributors covers palliative medicine, service provision, ethical issues and symptom management. It includes information on specific illnesses, such as heart disease, dementia and HIV, and provides assessment tools with an easy-to-read summary of them. The section on oncology would be relevant to anyone working or with an interest in this area. The section on populations with cancer and symptom management presents images of scans and their interpretation as learning points. I especially welcomed the chapter on alternative therapies, which is applicable to UK settings despite being written from a US perspective, and as a paediatric oncology nurse, I was interested in the chapters on care of the very young. Disappointingly, there was only a short section dedicated to parental grief. In conclusion, the book contains something for all professionals working with patients at end of life, whether in the hospital or community settings. It is a useful starting point for study in this area.